Just in time for Thanksgiving . . . This is the same as the precious elephant dress but in a size 3. 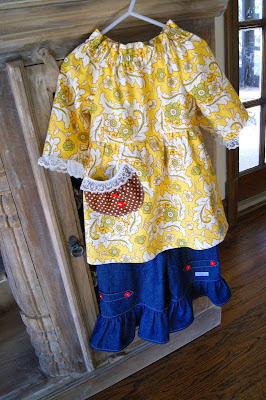 Only this time it has some matching denim ruffles! I looooove some ruffles. Don't worry if they aren't for you -- you can just buy the dress. But you do get first dibs on these pants if you want them :). So here's the dress by itself. This can be worn as a tunic when it gets a little too short. 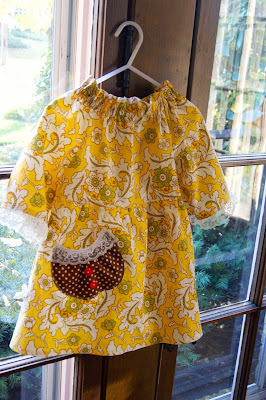 The dress hits just above the knee on most little ones, but it's still precious a little long or a little short. The sleeves are a couple of inches from the wrist, so your little one won't get sweet potatoes all over them. The ruffle pants have a comfy elastic waist -- Mimi always gets 2 years out of hers. They are made of a heavier weight denim that is perfect for temps below 65. 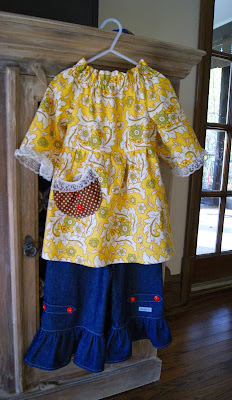 Love, love, love a pocket for all the things that your little one just has to take with her. Rocks and pennies and such. The top and bottoms are both a size 3, but honestly I would put it on Mimi from sizes 2-4 it's so versatile. The dress is $38 plus shipping if you can't make it for a playdate with me. The pants are $30 and if the owner of this dress decides to not buy them I will let someone take a chance at them. I might even be able to make a fun embroidered t-shirt to match. Rudolph anyone? If you're interested, e-mail me at mimiandmack@yahoo.com. Ready, set, GO! Both patterns are from the wonderful Amy at Brownie Goose. You can find all of her patterns here if you want to take a stab at making this yourself. I have completely WORN OUT her patterns this fall. I have many other ideas up my sleeve, but I want to use her designs first because they fit perfectly with my fall fabrics. 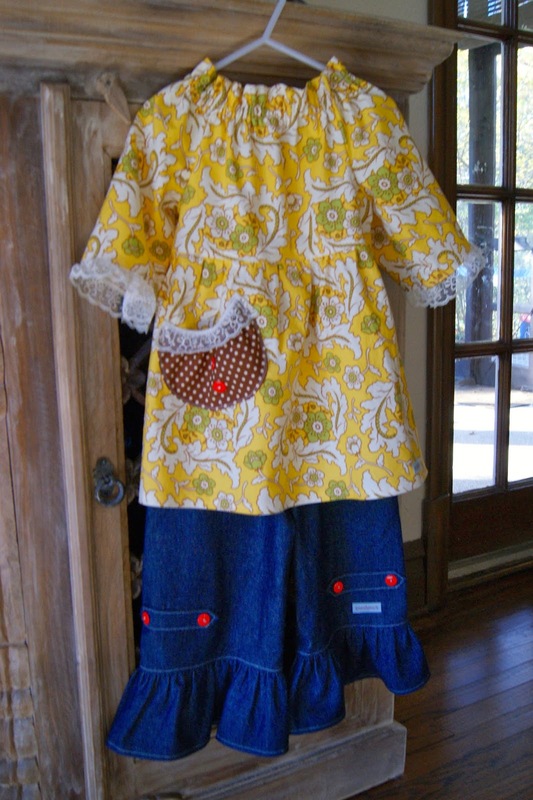 Most importantly, Mimi has some of these dresses that Amy made when she was still in business, and she is STILL wearing them as shirts three years later. $12 a year for a dress is right up my cheap alley!